Larry the Cucumber is DukeNa nobleman with a problem. His house guests, the Knights in White Satin, are to compete in a big tournament, but Larry can't find a dependable night watchman to guard his castle. Will Larry find a dependable watchman before its too late? This illustrated book comes with an audio CD. Full color. 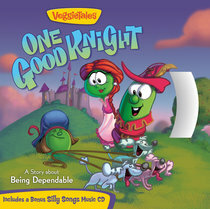 About "One Good Night (With CD) (Veggie Tales (Veggietales) Series)"